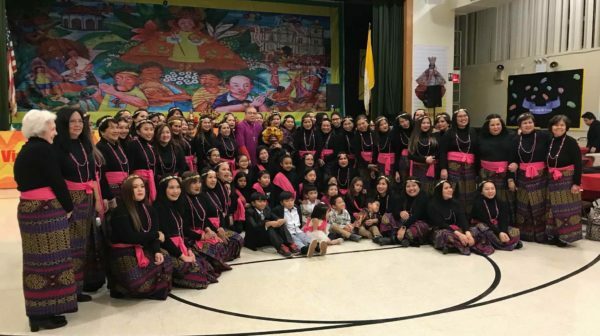 Archbishop Bernardito Auza, the permanent observer of the Holy See to the U.S., joined local Filipinos at the Shine Church of St. Jude, Canarsie, on Jan. 20 for the celebration of the Sinulog. The event was sponsored by the Filipino-American Community of the Shrine Church of St. Jude and the Sto. Niño Devotees of Northeast USA. Concelebrating the Mass were Msgr. John Delendick, pastor, and Father Dominic Peprah, parochial vicar. St. Francis Catholic Singles, for those in their 30s, 40s and 50s, will host Movie Night on Feb. 22. Come explore the themes of jus- tice and vigilantism with Agatha Christie’s classic “And Then There Were None,” at Holy Family Parish, Staten Island. The screen- ing will happen in the church basement, 366 Watchogue Road at 7:15 pm. A free will donation of $5-10 will be appreciated at the door. Popcorn, hot chocolate and snacks will be served. For more information, visit www.sgspsi.org or send an email to sfcssi@gmail.com. The Sisterhood of Catholic Women and Adolescents is proud to announce that it will be offering its second 13-week semester on fertility awareness and Catholic sexual morality. Women can sign up and learn how to chart their menstrual cycles as well as break open the beauty of God’s design for human sexuality. The free course is open to women ages 17 and older. For more information about dates and times, contact Nicole Moore, Nicole@staugustinefounda- tion.org or at 914-613-5468. Visit http://sisterhoodcwa.com/. The Sisters in Faith of St. Athanasius, Bensonhurst, invite women to come share and learn about their faith on March 7 at 7 p.m. in the Nazareth Institute. Call Christine, 347-729-3322. 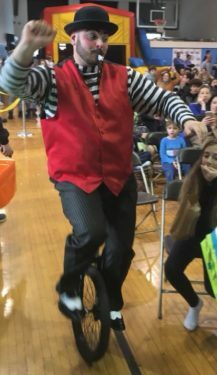 In honor of the feast day of St. John Bosco, the Bensonhurst Youth Cluster held a festival for the area’s children complete with a bouncy castle and of course, a clown in the gym at St. Peter Catholic Academy. Born 202 years ago, Don Bosco, as he is popularly known, came from a poor family and despite great odds was ordained priest. He was enthralled by circus performers from a young age and learned some of their tricks, which he later used to evangelize poor youth. He established the Society of St. Francis de Sales. 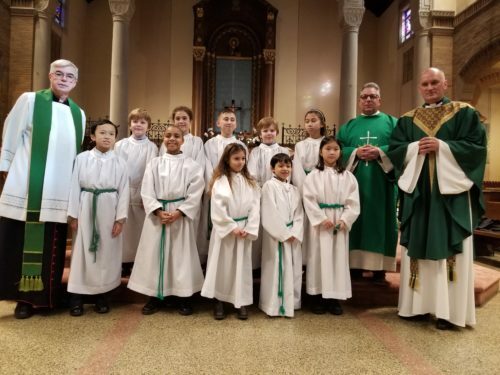 Ten boys and girls were installed to serve at the Altar of God at Our Lady of Mercy, Forest Hills, Jan. 21. “It was a delight to see,” said a parishioner after the installation Mass. “The children were like little angels, happy and eager to please Father Gregory, as he coached them for their holy moment. These are the special everyday joys that I cherish. We need to be open to receiving them.” Above, Msgr. John McGuirl, Deacon Dean Dobbins and Father Grzegorz (Gregory) Stasiak congratulate the youth. Join Tablet TALK. Send items to azielinska@diobrook.org or call 718-517-3132.